I just returned from a 56km Boosted Board ride. I toured the bike trails along the Upper/Lower Crystal Springs Reservoirs and San Andreas Lake here in the San Francisco Bay Area. This is a new record for me. My previous range record was 27km on a single charge. 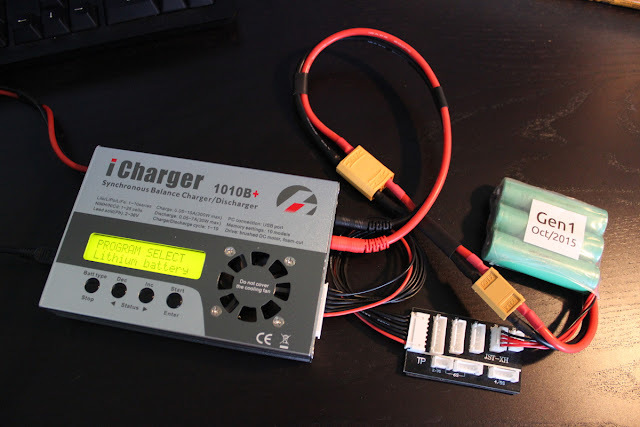 To achieve this I used a very large and custom designed lithium-ion battery pack. 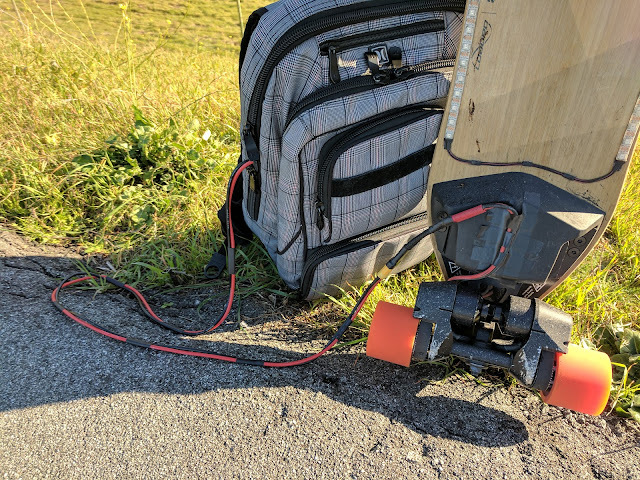 I tossed it in my backpack and connected it to the Boosted Board where I had previously made a modification to expose the internal battery voltage rail. This pack is arranged in a 10S6P (10-series, 6-parallel) configuration. It has a rated capacity of 21Ah at 37V nominal or roughly 777Wh. The internal battery of the Boosted Board has a rated capacity of 99Wh. This battery pack is designed to attach to a custom designed board that I have been working on but is not ready for prime time yet. Below is a sneak preview of the board I am working on. I have decided to name it Voyager as one of the design goals has been to prioritize range. Continue reading to learn more about my new record and construction of this battery pack. There are also more pictures of Voyager at the bottom of this post. I have long wanted to become more well acquainted with the Linux kernel and finally decided to bite the bullet. I ordered an iMX233-OLinuXino-MAXI from Olimex to tinker with. The Freescale i.MX23 processor is noteworthy because it is available in an LQFP-128 package which means it can be installed on a PCB by hand with inexpensive tools and a steady hand. It is also a great platform to learn with because it is well supported by the upstream kernel and has documentation available without signing an NDA. The first thing I did was modify the device tree (DTS files) to enable the LCD controller and tuned it to generate a VGA signal. 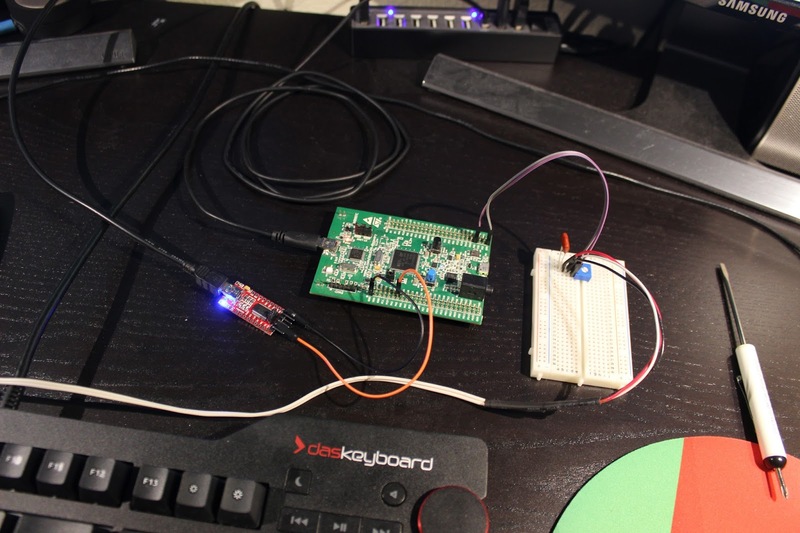 I built a simple R/R2 DAC on a breadboard and was able to view the image on an LCD monitor. All of this was completed under Arch Linux ARM which provides a minimal base image and root filesystem upon which a large number of packages have been ported to run on ARM. This has been a great learning experience and I plan to continue working with this chip more. Continue reading to see the very minor changes I made to the kernel and how I wired it all up. Over the past couple of days I have ported libmikmod to run on an STM32F407. This is a very memory constrained environment with only 128kB of RAM but I am able to play some rather complex MOD and XM files that are in the range of 60kB in size. I had to patch libmikmod slightly and write a new audio output driver to make all of this happen. The audio quality is quite good. I currently have MikMod configured to render at 44.1kHz in mono. I could likely render in stereo but I would be limited to smaller MOD and XM files due to the increased memory usage. Here is a video that mainly shows the audio quality as captured by my camera. The video below contains a little more technical detail, demonstration of boot and loading different audio files.